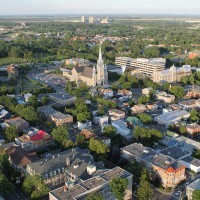 Joliette, a Canadian city located in Quebec in the region of Lanaudière, is inhabited by approximately 20,000 people. In terms of culture, Joliette is a city of music par excellence. It is known by the Orchestre symphonique des jeunes de Joliette (OSJJ), la grande fête interculturelle and also the festival international de musique classique. As for sports, Joliette had the privilege to organize the archery competitions of the Montreal Olympic Games in 1976 and the Quebec games in the summer of 1978.